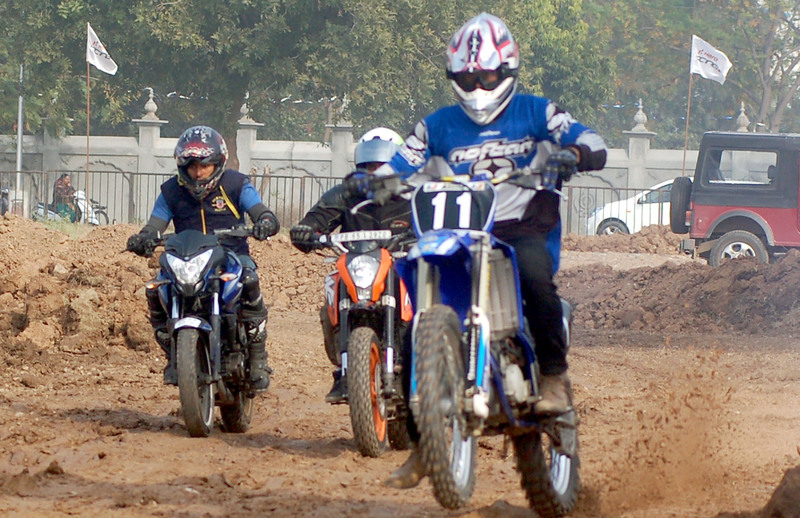 Chandigarh , December 19 : Scrutiny and competitor trials were held for the 6th Hero Racing OYA Autocross Motocross and Off-road Challenge at GAMADA ground, opposite PUDA office, Phase 8, Mohali today. There was a huge rush of spectators around the ground, as the contestants practiced at the track to give their best in the competition. The qualifying rounds will be organised tomorrow and the this mega event will be flagged-off by the Deputy Commissioner of Mohali, Tejinder Pal Sidhu and the Principal of YPS School, RP Devgan. All the vehicles participating in the event including diverse makes of two-wheelers and four-wheelers were inspected. The vehicles were scrutinized as per the norms of the Federation of Motorsport Clubs of India (FMSCI). The finest teams from different parts of the country reached today for this grueling challenge which included Hero Racing team, A2B team, TVS Riders, Jaipur Riders, Delhi Bikers Club, Tusker Motorsport, Capital Offroaders, 4X4 Earth Crawlers, Gerrari Offroaders Xtreme Offroaders, Ludhiana and Mudaholics Jalandhar. The seasoned rallyists like Sanjay Sikand, Bobby Bhogal, Phil Mathous, Abhishek Mishra, Harpreet Bawa and Harkaran Singh were also seen practicing for this fierce fight. Commenting on the event, the Clarke of the Course, Gulpreet Aulakh, “This time your adrenaline will race up and down, for the 6th Hero Racing OYA Autocross Motocross and Off-road Challenge as it gets bigger and better. The event will be high on adventure and also rigorous in its approach. Like always this time too, the participants have to sweat it out to win. Everything from the word go will be a test of endurance and technique”. According to steward and Co-Founder TCAS, Nikhil Jaspal, “The event boasts of the biggest dirt flat track with a bridge cross in India. Adventure lovers will enjoy the triple treat – AutoCross, MotoCross and Off-Roading. We have taken full care of safety norms and two life-support ambulaces with paramedic staff have been stationed at the spot during”. The event has been organized by Old Yadvindrians Association (OYA) in collaboration with Team Chandigarh Adventure Sports (TCAS).